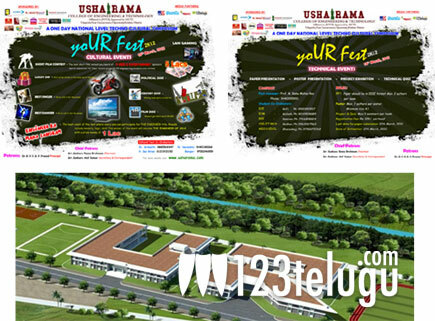 UshaRama College of Engineering is conducting yoURfest 2k12 on March 16th. Lots of cultural programs such as cricket quiz,moviequiz,political quiz, Engineer Kasangram,bestsinger,best dancer with sensational prizes likeBIKE , LCD Tv and 50 , 000 rupees worth DVD’s & cricket kitsetc. One of the key competitions will be short films among engineering students in which the winner gets to get 5 lakh worth resources to make his next project from 14 reels entertainment. * Any engineering student can participate in this event. * VENNELA 1 ½ and Routine love story teams are going to special attraction on this event.